We don’t really go all out for Valentine’s Day. I get Marty a small gift and make him a card and we spend a quiet night at home. I like to get the kids a little Valentine’s Day surprise as well. Some years it’s candy. Some years it’s personal care items. This year, I wanted to include something small that I made but I wasn’t sure what. I decided to go with some Valentine’s Day candy. I don’t buy candy often for the kids but Valentine’s Day is one of those exceptions. Of course, I didn’t want to give them a HUGE box or bag full of candy either. I decided that these Valentine origami boxes would be the perfect solution. I didn’t want to buy a plastic bucket or trinket from the store to hold their candy because after the holidays you just have another piece of plastic clutter to deal with. These boxes can be enjoyed and then recycled. I’ve been doing origami for years. When I started, I made simple frogs and butterflies. They’re fun to add to note cards or scrapbook projects. 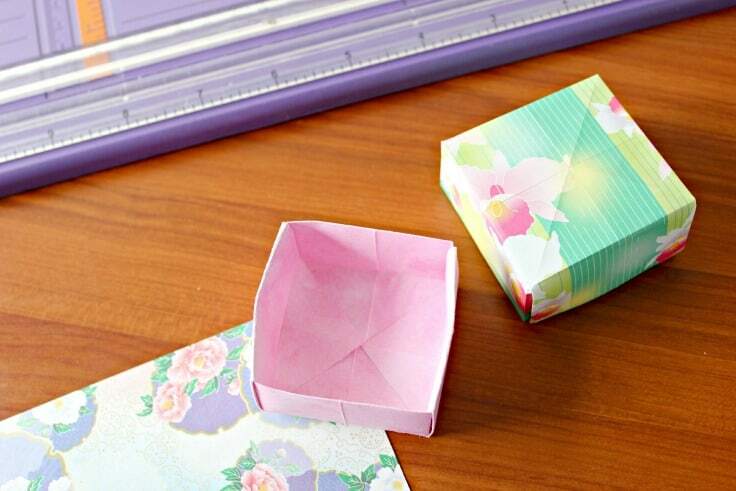 These Valentine origami boxes are really very easy to make. 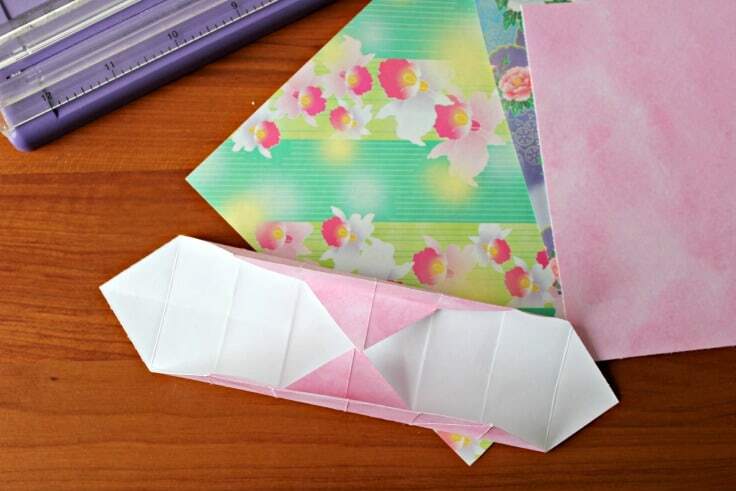 Most of the time when I do origami, I start with origami paper. In this case, starting with scrapbook paper is easier for the bottom of the box and will result in a sturdier box. You can use origami paper for the top if you like. The size paper you start with depends on the size box you want to have. Your paper needs to be a square. You can do any size you like as long as it is a square. The bottom will need to be 1/2″ smaller all the way around than the top piece. So if you use an 8″x 8″ piece for the top, you’ll need a 7.5″ x 7.5″ for the bottom. Cut it with a personal cutter so it’s even instead of with scissors. Fold your square in half to make a triangle. Unfold it and then fold it in half to make a triangle the other direction. Unfold it. Your piece of paper should look like it has 4 small triangles on it now. Fold your square in half to make a rectangle. Then unfold it and then fold it in half to make a rectangle the other direction. Unfold it. now it should look like it has 8 small triangles on it. Place the design side of the paper against the table so you see the white part when you look down. Fold each corner into the center so that you have a square. Fold up the bottom of the square to meet in the center. Fold down the top of the square to meet in the center. Now you should have a rectangle. Unfold. Turn the paper once and repeat the above step so you’re folding in a different top and bottom. Unfold all but the top and bottom triangles. Fold the top and bottom edges in to the center of the paper and then stand up slightly to be the edges of the box. Gently push in the corner triangle on each side and fold the flap over to make the smaller edge of the box. See in my photo where I drew in green. Then fold the top down. Repeat for the other corner and then turn and repeat for the other edge of the box. Then do this entire thing over again for the other half of the box. You can use a tiny bit of glue to help hold the flaps down if you need to. Fill the bottom of the box with whatever you want and carefully put the top on. If you’re looking for an easy Valentine craft, I hope you’ll try these Valentine origami boxes. You can vary the colors for any holiday or occasion. Those are adorable!!! I just hope my hands can handle the folding. Perfect for a kid's class or for little gifts for your friends!! Pinned it! Thanks, Jamie. It really was fairly easy. I have arthritis in my left hand and this didn't bother me. Very pretty! I love little boxes like this and my son is into origami lately. I will definitely be sharing this design with him! Thanks, Dawn. Hope he has fun with it! Popping over from Motivation Monday =) Super cute boxes! i've always loved origami but never had the patience for it. Linking up to your Thrilling Thursday link up too ! Be sure to share your crafts & DIYs at Two Uses Tuesday (Mon 11pm EST to Fri 11pm EST, but its a month long in February) over at Sarah Celebrates if you don't already! Thanks so much for stopping by. I'll check it out! You are very welcome, Barb! You are so talented. I love oragami anything, it's so cool. Now to find the time to make these! Thank you so much, Rachel! I'd love more time too LOL. Very pretty! I love the papers you chose. I've made these boxes before but never thought about making a lid. Simply genius! Thank you! I like the way they fit together and hide the surprise inside. These are so sweet and pretty! Love the springtime colors, too! Thank you, Beth. I do love flower papers. I cannot wait till spring. Thanks so much for including me. I'm heading there now to share!